The beauty of Paid Discovery on StumbleUpon is that your promoted content has social elements as a foundation. Not only are you reaching a defined audience, but your content’s reach is also amplified through social sharing, which you don’t have to pay for. You only pay for unique visitors to your website or blog. For example, if you want to promote a video using Paid Discovery that is hosted on your site and many different visitors like or share the content, that is free exposure that you wouldn’t have gotten if you didn’t use Paid Discovery on StumbleUpon. If your content resonates with your audience, a quick way for them to give their feedback is to click the Like button on their StumbleUpon toolbar. In the main page of StumbleUpon, you see how many likes a piece of content has by looking at the number toward the bottom of each widget. Content that has a large of likes indicates that is regarded as quality by the StumbleUpon community, precisely why you want your content to be liked. You have a multitude of ways to share using the StumbleUpon toolbar. Anytime a Stumbler performs one of these actions, it gives your content greater reach. For free! 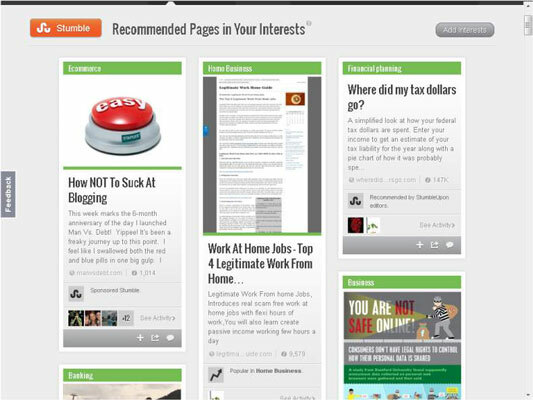 Here are some of the ways StumbleUpon users can share your content. So when thinking about using Paid Discovery, you can calculate the return by spreading the budget over all the organic sharing that results from promoting your content. It always drives down the initial cost. Let’s plug in some numbers. Your budget was $100 and you received 400 clicks and 50 shares. You shaved off $12.25 of your budget due to your content having received 50 free shares. Imagine if you had 400 shares. Hint: You’d be paying a total of $0.25 for Paid Discovery! Now you’ll still actually be paying the money, but this is a good formula to calculate the value of free sharing as a result of promoting your content with Paid Discovery.